The Real Estate Management Institute- REMI’s recently concluded first ever Owner Developer Program (ODP) lived up to its objectives i.e. to offer the real estate’s leaders and the Generation NEXT the tools they needed to lead from the front in a fast-changing, volatile industry . 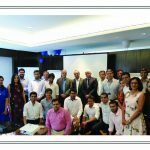 The program saw participants from leading real estate organisations like Runwal, Kanakia, Marathon Transcon, Ajmera, Nirmal Lifestyles, Ashford to name a few, who worked right through lectures, workshops and assignments to understand the rapidly transforming landscapes of the Indian real estate industry. The REMI- ODP was held over a period of 5 full days i.e 7th, 8th, 15th, 21st and 22nd March 2017 in Mumbai. The sessions were delivered by a wide range of industry and academic experts who led the participants through well –prepared, highly relevant presentations. The session covered a wide range of important topics like RERA and Compliance, Change Management, The New DP-DCR and Design Elements, Smart Cities, New Developments in Construction Technology, the IND AS, GST, Project Feasibility, Legal Due Diligence, Customer Centricity, Fundraising & REITS. Mr. Sagar Kadam, Partner DSK Legal, to name a few. The CEO of MCHI, Mr S.S. Hussain addressed the participants on Policy and Change on the first day, while the MD and CEO of Mayfair Housing delivered the key note address at the end of the program on ‘Building the Next Generation Real Estate Enterprise’. The program ended with a celebratory Cocktails and Dinner which offered the participants, speakers and invitees a great opportunity to network and build relations. The success of the REMI-ODP can be measured by the fact that participants expressed the need for many such programs and asked for trainings to be conducted by The Real Estate Management Institute for their individual organisations. REMI has also been invited to conduct this ODP across other cities in India and this has clearly highlighted the relevance of the program to the Indian Real estate industry. Upcoming programs will be announced on the website www.remi.edu.in . Thank you for another informative blog. Where else may I get that kind of information written in such an ideal approach? pretty fast. I’m thinking about setting up my own but I’m not sure where to begin. Do you have any tips or suggestions?